Traditionally, gold has been the material of choice for inlays and onlays. In recent years, however, porcelain has become increasingly popular due to its strength and color, which can potentially match the natural color of your teeth. 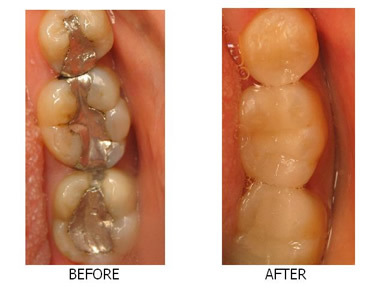 In our office a CEREC, computerized restoration is made from porcelain and can restore your teeth to look and feel natural. Look under “Advanced Technology” for more information. At the second appointment, the temporary sealant is removed.Thedentistwill then make sure that the inlay or onlay fits correctly. If the fit is satisfactory, the inlay or onlay will be bonded to the tooth with a strong resin and polished to a smooth finish. Fortunately with CEREC we can eliminate the need for a second appointment and deliver the restoration within a few minuets after it has been scanned.